So…this is photo shoot #2. The pictures still don’t do this lasagna justice. But, I can say with certainty that this is one of my favorite pasta recipes. It’s that good. 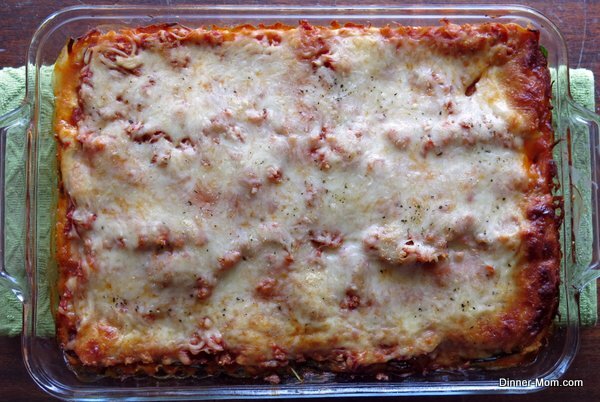 I’m going to walk you through my favorite preparation of this lasagna. But, as you know, my days at the meal assembly store compel me to give you all the tips I have to make it your “own” favorite lasagna. Jump down to the the end of the post to see these! While the vegetables are roasting, cook the lasagna noodles. I’ve used the no-boil kind and fresh pasta sheets. 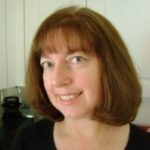 But, I usually end up with the boxed whole wheat lasagna noodles because they are cheap, readily available and healthy. Even though the box says to cook 2-3 at a time, I add all nine noodles at once and tend to them very carefully. 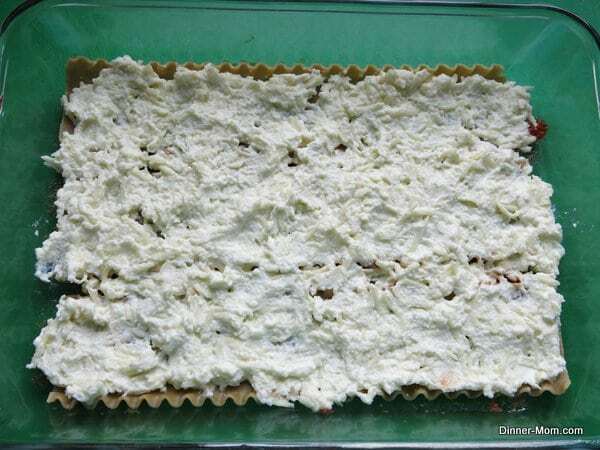 To make the cheese mixture combine the ricotta, mozzarella, egg and garlic. I mix this up in a bowl and then use the spoon to make a line down the middle so it is divided in half and ready to go. When the vegetables come out of the oven, combine them with 1 3/4 cups of pasta sauce. The recipe calls for one 24 ounce jar of pasta sauce. So, whatever you don’t mix with the vegetables, will be used in the very last layer. I often experiment with different pasta sauce varieties–extra cheese, fire-roasted tomatoes, marsala mushroom. But, standard tomato and basil always works well. Start with a scant amount of pasta sauce in the bottom of the pan. Layer 3 noodle strips in the pan and top with half of the cheese mixture. I used my fingers to press the mixture as evenly as I could over the noodles. 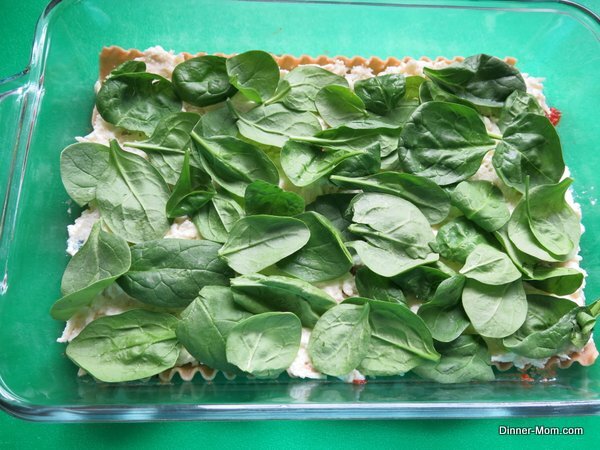 Layer a handful of baby spinach leaves on top of the cheese mixture. Layer half the vegetable/pasta (about 2 cups) sauce mixture over the spinach. Now, repeat the layering process a second time: lasagna noodles, cheese mixture, spinach leaves, vegetable pasta mixture. 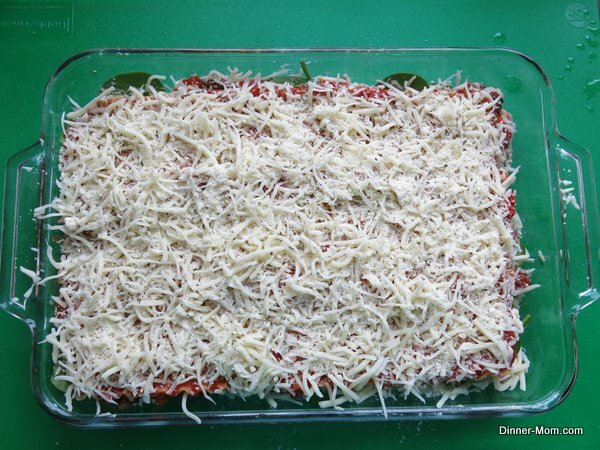 For the top layer, add 3 more noodles, a cup of pasta sauce, plenty of mozzarella cheese and then sprinkle Parmesan cheese over the top. Bake in the oven for about 30-45 minutes or until the lasagna is baked through (to about 145 degrees) and the cheese on top is melted and bubbly. Allow it to set and cool for about 15 minutes before serving. Make it ahead and freeze it – Make up the recipe, but don’t cook it. Cover and freeze for up to 2 months. Defrost and cook per instructions. Or, you can cook it from frozen-it will take a long time, approximately 2 hours. Freeze the leftovers – Cool the pan of leftover lasagna, preferably refrigerate for a little while to make it easier to work with. Cut into sections, wrap in plastic wrap and store in the freezer for quick individual servings. Microwave individual servings from frozen for about 3 minutes, depending upon your microwave. 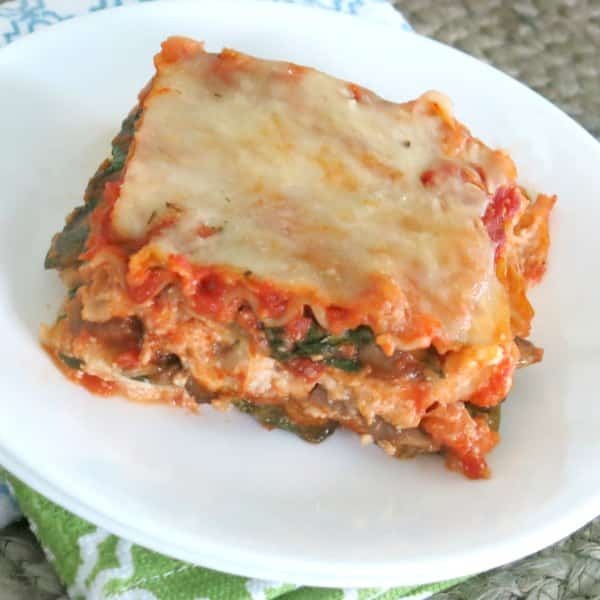 Make it healthy – Use whole wheat lasagna noodles and low-fat cheeses. Make it vegan – Leave out the ricotta and egg and replace the cheese with a Vegan version such as products made by Daiya or Galaxy Nutrition. Boost the nutrition even more – This recipe is healthy. But, you can be pretty sneaky with lasagna because the pasta sauce and cheese can mask a lot of ingredients. Add some protein by pureeing chick peas or white beans and adding it to the cheese mixture. Sprinkle some flax seed in a layer. Replace the vegetable choices – The recipe calls for about 7-8 cups of raw vegetables which reduce down to about 4 cups cooked. Some suggestions: asparagus, yellow squash. sweet corn and kale. 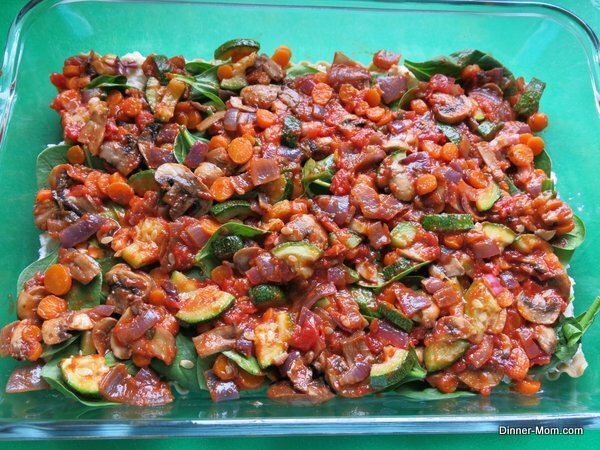 Roasted vegetable lasagna is so delicious with mushrooms, onions, zucchini, carrots, spinach and lots of cheese. Use low-fat cheeses and whole grain noodles for a healthy dish that is low in points. Toss chopped vegetables, except for spinach, with olive oil and season with salt and pepper. 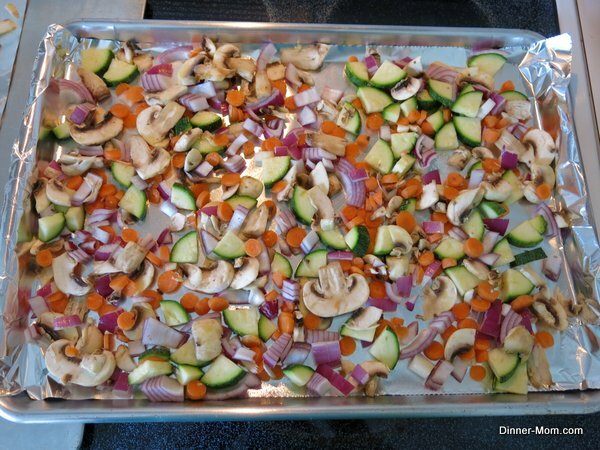 Place vegetables on a baking sheet coated with cooking spray and cook for about 20 minutes or until tender. Cook lasagna noodles according directions. Cool vegetables slightly and combine with 1 3/4 cups of pasta sauce. In a separate bowl combine ricotta, 2 cups of mozzarella cheese, egg and garlic. Stir well and divide in half. Coat the bottom of a 9 x 13 baking dish with a scant amount of pasta sauce. Layer 3 lasagna noodles in the bottom of the baking dish. Cover noodles with half of the cheese mixture, using finger tips to evenly spread if necessary. Layer a handful of baby spinach leaves for the cheese mixture. Layer half of the vegetable mixture (about 2 cups) over the baby spinach leaves. Repeat steps 8 through 11 for the second layer. Top with 3 more lasagna noodles, remaining pasta sauce, 2 cups mozzarella cheese and Parmesan cheese. Bake uncovered for 30 to 40 minutes or until internal temperature reaches 145 degrees and the cheese is melted and bubbly. Allow lasagna to cool for about 15 minutes before serving. Make ahead of time and freeze until ready to cook. Or, cook and then wrap individual servings for freezer storage. Substitute your favorite vegetables. This recipe calls for about 8 cups raw or 4 cups cooked vegetables. We are having WW pasta with sun-dried tomato meatballs and spinach ( sorry E!) for dinner tonight, but I have had a hankering for lasagna and this recipe is the one!!! 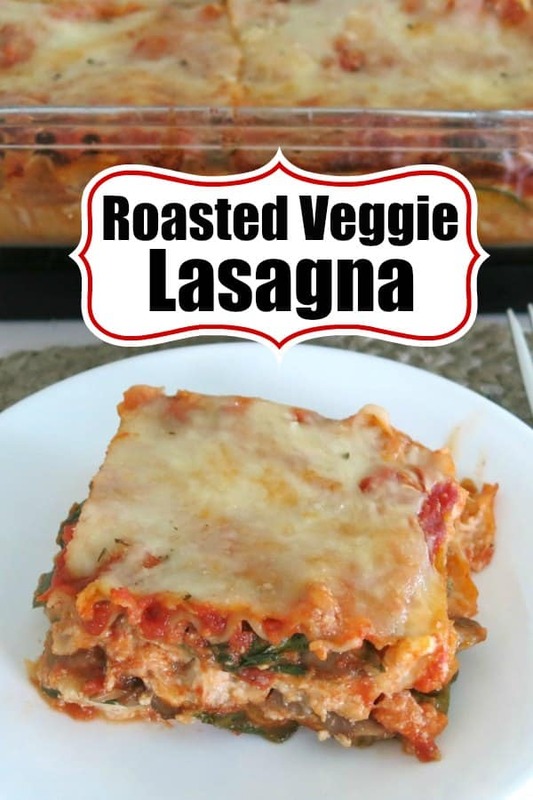 I never tried a veggie lasagna, you made my day! A perfect easy recipe, thanks.